We love this! The latest social media challenge is one part "Make Something Cool Every Day"and one part #30daysofbiking. But don't worry, lazy bones, you don't actually have to exercise anything but your creative muscles! 30daysofcreativity.com challenges Twin Citians to do something artistic every day in the month of June and blog/Tweet/Facebook about it -- whether it's making something new each and every day or just working on/documenting one big project over the month. And we've totally signed up already! And by "signed up" we mean tweeted "We're in!" to @createstuff. 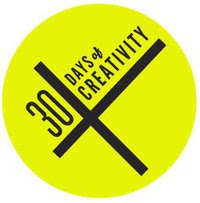 The group encourages communications and critiques via the twitter hashtag #30DaysofCreativity. So start idea-generating...June 1st is the kick off!